I kind of feel like every day since I have been back from my holidays it has done nothing but rain! Any of you got that feeling? So I thought today’s wedding fit really well with my mood. Mike and Emily are PhD scientists who work on solar panel research, so hosting their wedding at Pickards Mountain Eco-Institute in Chapel Hill was a perfect way to integrate their unique story into their wedding? Not to mention how handy it is to have a wedding party full of of PhDs when your reception tent floods and you need a team of engineers to construct a moat quickly. Where most wedding parties would have been at a loss as to how to help, Mike and Emily’s crew jumped right in to the flooded tent and quickly resolved the issue (go science and engineering!). Our mantra for the wedding during the planning process was “good people, good food, good beer.” bride, Emily told us. We wanted to get get married at a place that would give us a lot of flexibility. We loved that PMEI is an authentic working organic farm, and not a wedding venue where someone was trying to schedule a choreographed ‘standard’ wedding. We are both PhD scientists who work on solar energy, so the 10kW PV array on site was definitely a draw! Even though there was rain, mud, and flooding, we made sure to have a great time with our family and friends. We were especially touched by how our guests were such great sports in spite of the cool weather and rain. Our awesome friends and family were even out there shoveling wet gravel and laying out straw to dry out the ground under the tent; they really saved the day, the tent was a swamp when the guys showed up for pictures. Our ceremony was conducted by a close family friend and was probably the nerdiest ceremony of all time – with many references to the big bang, and quotes from Einstein. We were sure to include some jokes, because we wanted laughter instead of tears. We had several DIY elements to the wedding. Family friends played folk and bluegrass music for a meet and greet ahead of time and for the ceremony. One of Emily’s childhood friends runs a locally sourced flower farm, so we bought buckets of flowers from them and my family arranged them. For table decorations, we used pictures of ourselves at different years of our lives, and everyone got a mason jar glass that had directions to the table with the appropriate year. For a guestbook everyone stamped and signed a beautiful fingerprint tree which was hand drawn by Mike’s mom, and lettered by a close family friend. Mike’s parents also made a set of corn hole boards, but we didn’t get to play on account of the rainy. They were great fun at the rehearsal dinner though. The shawl that I wore in the ceremony was crouched by one of the bridesmaids, and my mom knit a bolero just in case it got cold (very useful!). One of Mike’s groomsmen, renowned for his great taste in music, put together a playlist that kept everyone moving all night and afterward we moved on for an after party at a “barcode” back in town. There’s nothing better than sharing great food with family and friends, so we wanted to make sure we had something special for our guests. We served our favorite indian food from introduced to us by a longtime friend of my family, with a few milder options for guests who don’t like spice. Idlees (steamed rice cakes) served with chutneys during the cocktail hour were the biggest hit of the wedding. We served beer from a local microbrew (Fullsteam Brewery). Instead of a cake we had local ice-cream from a local dairy (Maple View Farms) along with Italian wedding cookies to celebrate Mike’s Italian heritage. People warned us we might not get a chance to eat at our own wedding, but there was no way we were going to miss out on such an epic meal! Really cool photos and venue. This is such a sweet wedding! I don’t know the couple but oh my god I want to be there friend haha! I love the dudes and their Bow-Ties! They are ROCKING them. Thanks for the feature, Bespoke ladies!! So glad Emily and Mike’s wedding got the spotlight for a day- it was a really awesome event. 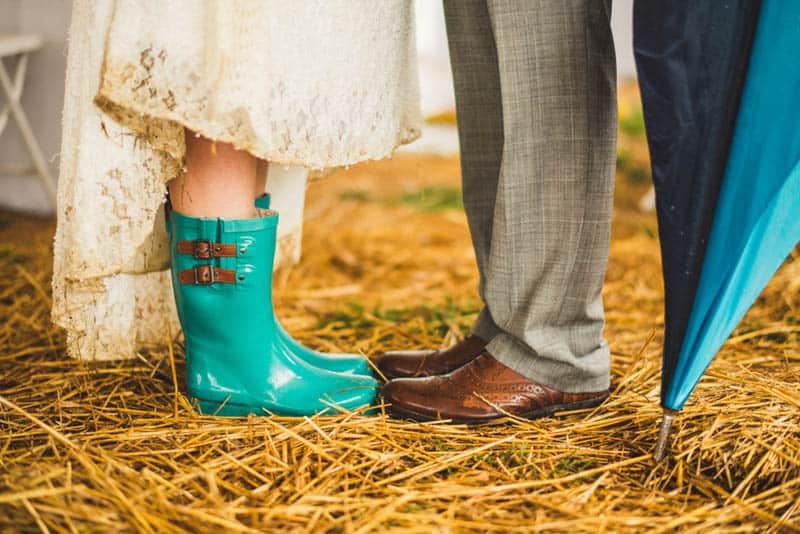 I love their mix and match bridesmaid dresses and that the girls wore rain boots! Super cute! Love your blog btw. I love the design and all the bright colors.